SHERWOOD — It was close. Too close for the Tualatin High School girls lacrosse team, especially with Northwest Oregon Conference supremacy on the line. So, with that in mind, the Timberwolves stepped up in the second half, and got a crucial victory to show for it. 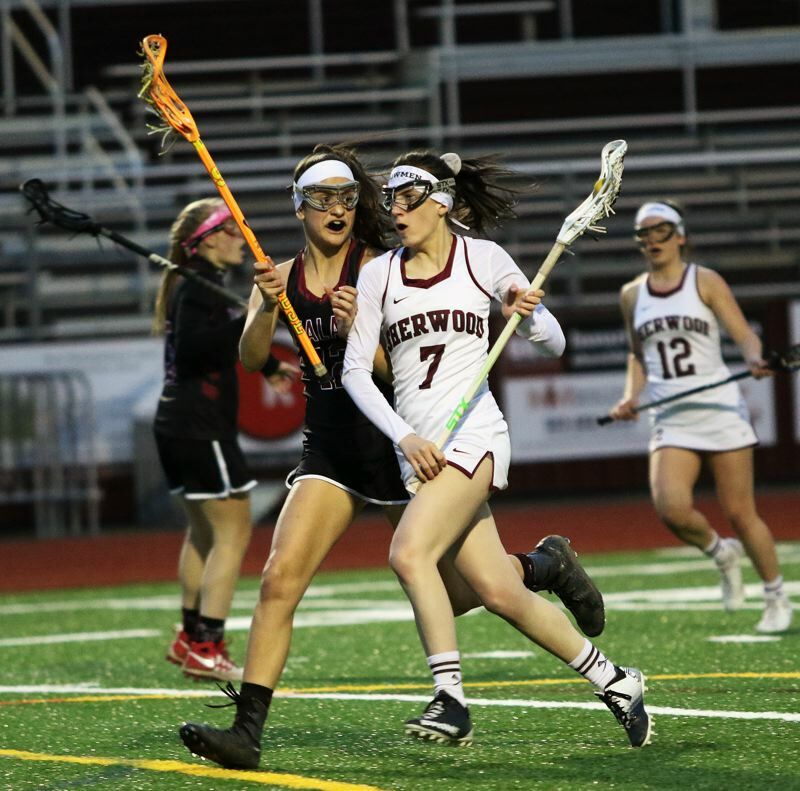 Tualatin, after holding just an 8-6 halftime lead over Sherwood, pulled away in the second half to get a 19-9 win over the Lady Bowmen in an NWOC showdown played Friday at Sherwood High School. 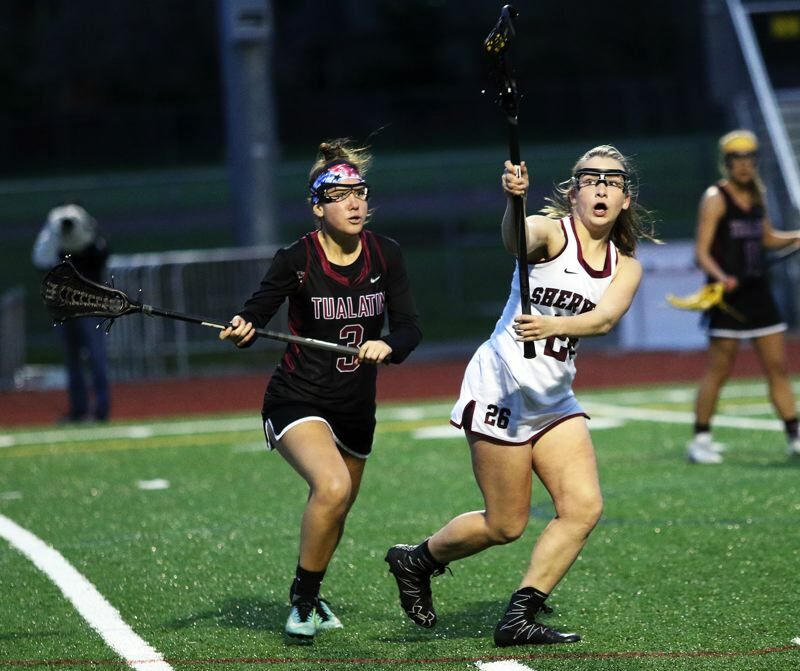 "At halftime, we talked about how we got on each other," said Tualatin junior Avery Gales, who scored a game-high eight goals in the victory. "We had to stay positive and cheer each other on." "We really played unselfish in the second half," added Tualatin junior Lauren Magnuson added. With the win, Tualatin improved to 4-0 in NWOC play (4-3 overall) at that point, putting the Wolves alone atop the conference standings. Sherwood moved to 2-1 in NWOC games (5-4 overall), with the setback. "This was a big win," Gales said. "It's like the conference championship game." "We showed that we really want the conference championship," Magunson said. "We wanted it more." The teams battled evenly in the opening minutes of the contest. Tualatin took a 3-2 lead when Gales scored on a drive from five yards out with 11 minutes and 57 seconds left to play in the first half. But Sherwood, getting back-to-back goals by Natalie West, came back to claim a 4-3 advantage with 8:17 remaining before halftime. The game was tied at 6-6, after Sherwood's Maeve Wiencek scored on a from seven yards out, following a zig-zag drive, coming with 1:23 left in the first half. 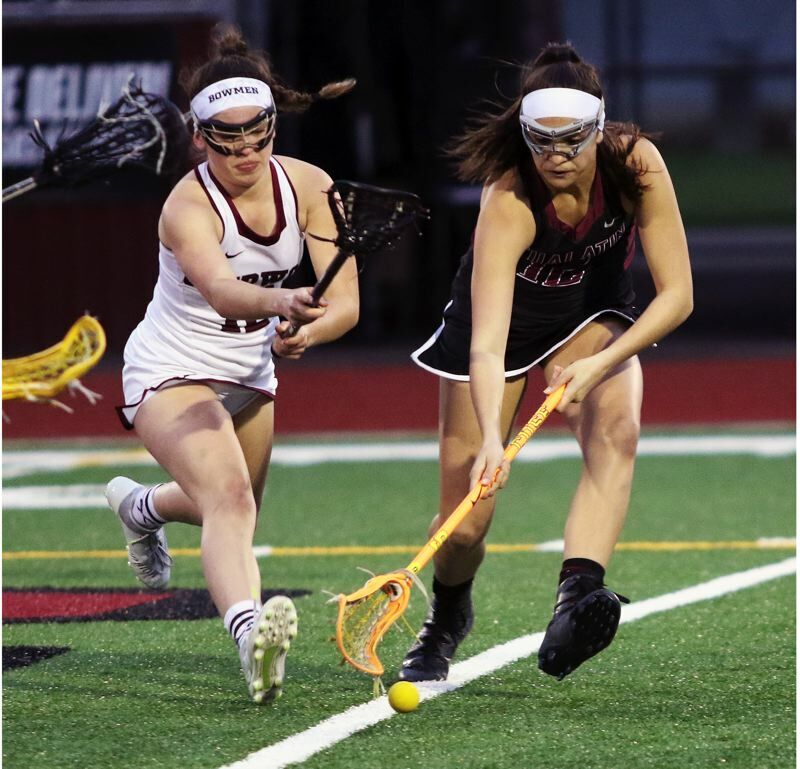 But Tualatin answered with the half with back-to-back goals by Gales, giving the Wolves an 8-6 lead with 29.8 seconds left in the half. 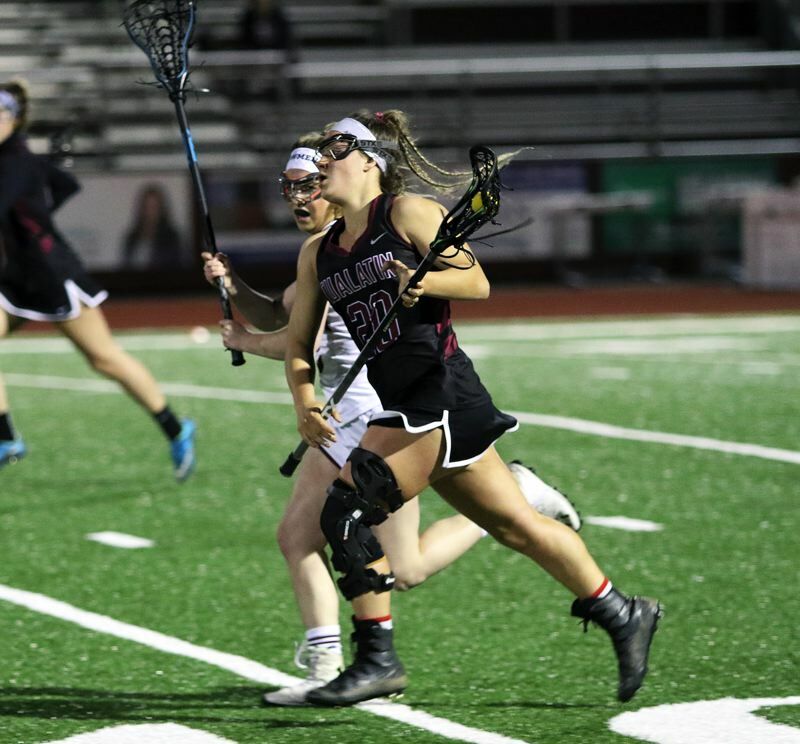 Tualatin goalie Marley Gilman then preserved the two-goal lead, running out to block a shot by Wiencek with eight seconds in the half. The game stayed close in the opening minutes of the second half. 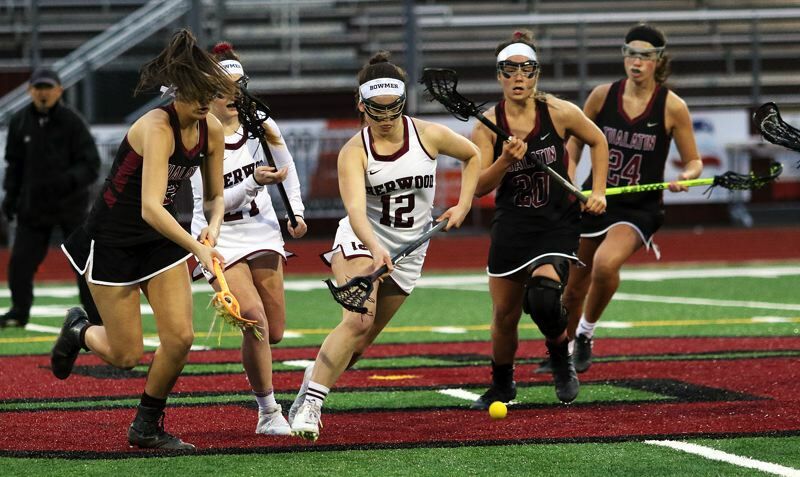 Tualatin got goals from Skylar Maddox, Sarah Hanson and Gales, and Sherwood answered with goals b Paige Cushing and Paige Thompson, leaving the Wolves with an 11-8 advantage with 17:53 remaining in the contest. That's when Tualatin took off. Consecutive goals by Hanson, Megan Jost and Gales quickly pushed the lead to 14-8 with 14:18 left to play. Magnuson then scored four consecutive goals, two coming off assists from Hanson and Sidney Dering, to make the score 18-8 with 4:13 remaining in the game. Late goals by Sherwood's Kendra Miller and Gales made the final score 19-9. "It was great," Magnuson said. "This will help get us to the playoffs." "It was so much fun," Gales said. "We want to win the state championship, and we have to win the conference title to have a chance at that." Gales had four assists to go with her game-high eight goals in the victory. Magnuson added five goals, four coming in the second half. Hanson scored four goals. Maddox and Jost had one goal apiece. For Sherwood, Wiencek, Thompson, Miller and West each had two goals. Cushing had the other Lady Bowmen goal. Sherwood bounced back on Monday to get a 20-6 win over Glencoe in a conference game played at Sherwood High School. Tualatin, on Tuesday, was edged 13-12 by Lincoln in a non-conference game played at Lincoln High School. The Wolves and Lady Bowmen were slated to have their rematch at Tualatin on Wednesday. Results of that game weren't available when the Times went to press. 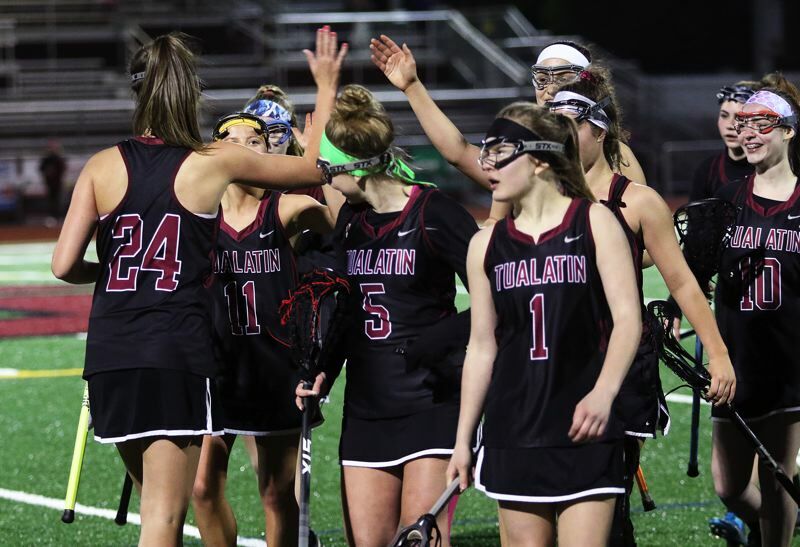 On Saturday, Tualatin will travel to Ballard, Wash., for a game starting at 12:30 p.m. The Wolves will then host Newberg Monday at 8 p.m. On Tuesday, Sherwood will play Century at 7:30 p.m. at the 53rd ave. fields in Hillsboro.